Arabesque means an ornamental design consisting of intertwined flowing lines, originally found in ancient Islamic art. The design reminds me of Arabic architecture. 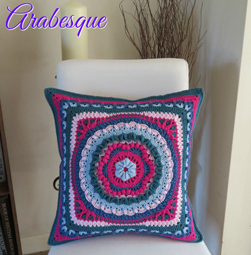 Arabesque is designed as a cushion facing but can be used with any of my afghan squares to make a multitude of items. This is a 20 inch square made with Stylecraft Cotton Classique Double Knit and a 4mm hook, using Aran/Worsted weight yarn and a 5mm hook the finished size will be approx. 24 inches. I used Denim 1 x 50g, Sky Blue 1 x 50g, Teal 2 x 50g, Shell Pink 1 x 50g, and Fuchsia 2 x 50g, with plenty to spare of each colour. You may remember, back in early May, I ran some Wonderful Workshops at Black Sheep Wools and Stylecraft. This was the cushion facing that the ladies who attended the workshops made, and they chose some amazing colours to work with. Here are two beautiful examples of how colourful you can make this square, wether you choose to use it as a cushion or to go with other squares. Ineke used her wonderful “Happy ” colours to match many of the blankets she has tested for me, and who wouldn’t feel happy with these colours around them. Lesley used pretty pastel colours, which would be gorgeous for a little girls bed. I would love to see examples of your Arabesque, please feel free to join my Facebook group, Helens Hookaholics.